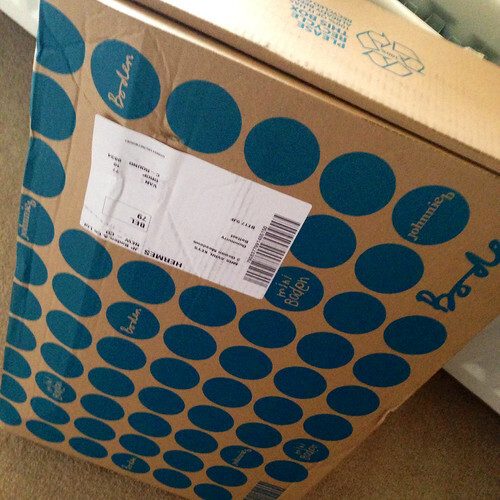 The Hermes man is a regular visitor as I keep ordering, returning and re-ordering from the sales...mostly Boden. With up to 70% off and free delivery & returns, last week was an opportunity to pick up some presents and some bits and pieces for the girls...oh and a couple of items for myself. This selection is what I've kept of the kids' range. The strawberry T-shirt is the most impressive piece - really lovely appliqué design and nice quality jersey material. I bought all of them in size 7-8 (the girls will be 6 in November) as I find Boden comes up small for my kids. There isn't a huge amount of room in any of the items, with the exception of the Pointelle t-shirt which is definitely too big for this summer...so I'd say size up regardless, so the kids get some wear out of them next year. It's hard to capture in a mirror selfie with poor lighting, but it's quite generous in fit - long in the sleeves and boxy and is a proper navy blue. It's substantial enough for autumn and the popper button closure is actually ok and makes it look neat when closed - I preferred it open on me though. Plenty of room for a light jumper underneath. So I concur with the sizing down in this case. 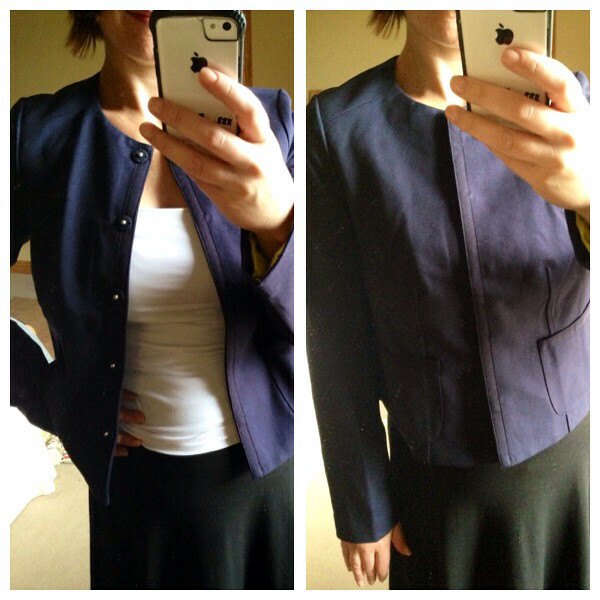 I only wore a vest under it and it was too small for me :( - but I prefer the fitted waist in this one over the Ponte. 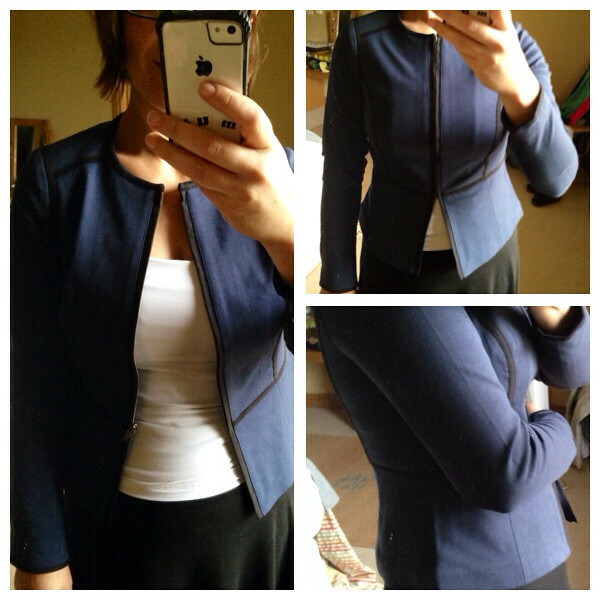 It's a more flattering shape and I liked how the zip only went from about 1/3rd up the jacket to the top. I've re-ordered it in a 12 and actually in a 14 too - just to see what the difference in size is. Will keep you posted on how I get on with the bigger sizes. Both going back I'm afraid. 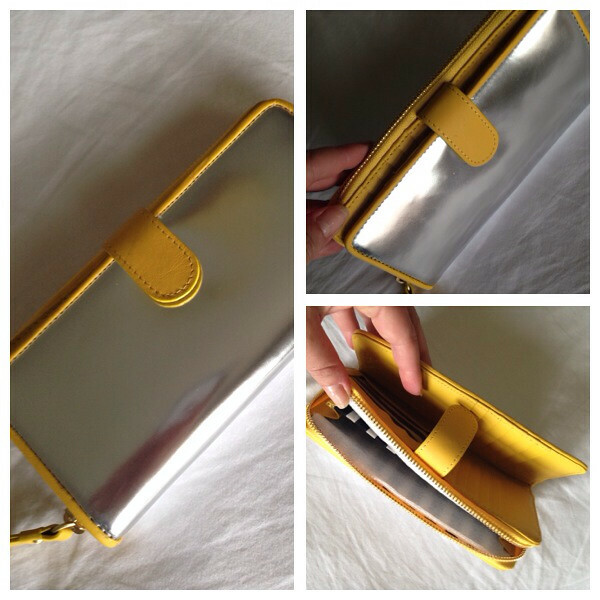 The wallet just wasn't as nice as I'd hoped and the metallic finish was covered in fingerprints and smudges when I took it out of the packaging...which put me off a bit. 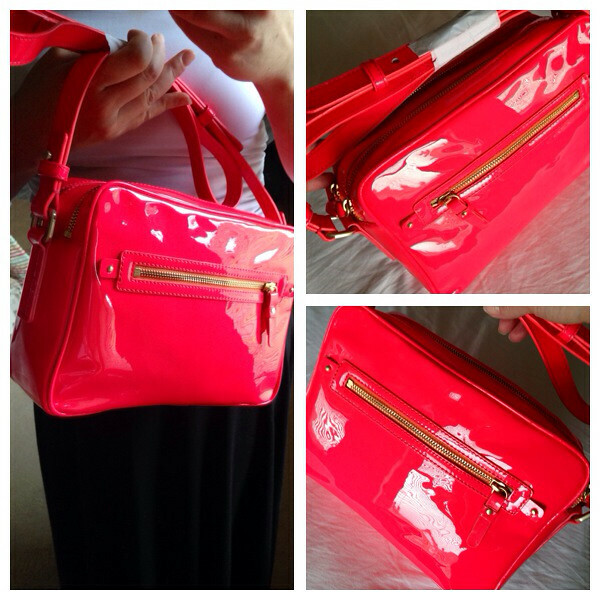 Meanwhile, the bag is really not a good colour. It's somewhere between a neon pink and neon orange and is very shiny..making it look a bit plasticky. Such a shame as the leopard print in this bag was simply stunning and I'm a bit sorry I didn't order it when I saw it at Vicky's Boden Party back in May. So another box waits to go back while a further one is dispatched to me as I type! All while I try my hardest not to look at the Autumn range just launched. It's stunning but I'm still in the summer mode while this weather continues to behave. Hope you're having a good weekend! 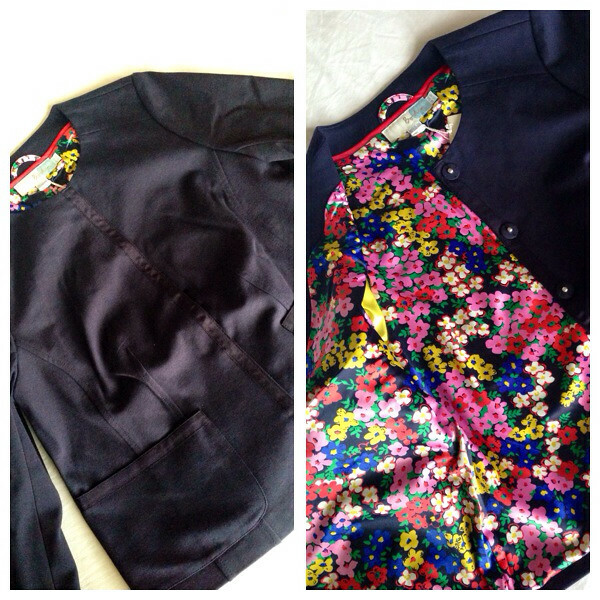 Love the pieces you've ordered for the girls Avril & you can never go wrong with a navy jacket. I definitely prefer the style of the second one, isn't it a pain with sizes though & never knowing which size to order. Thank goodness the other sizes were still available! I found the Mini Pointelle tees come up tiny both on the winter long sleeve & summer short sleeve versions! Elodie already wears 3-4 in those yet 2-3 in all other Mini tees. In fact she's also still in 1.5-2 tees this summer. I'll be sad to pack those up knowing no child of mine will wear them again! I ordered the dress above in black and blue. 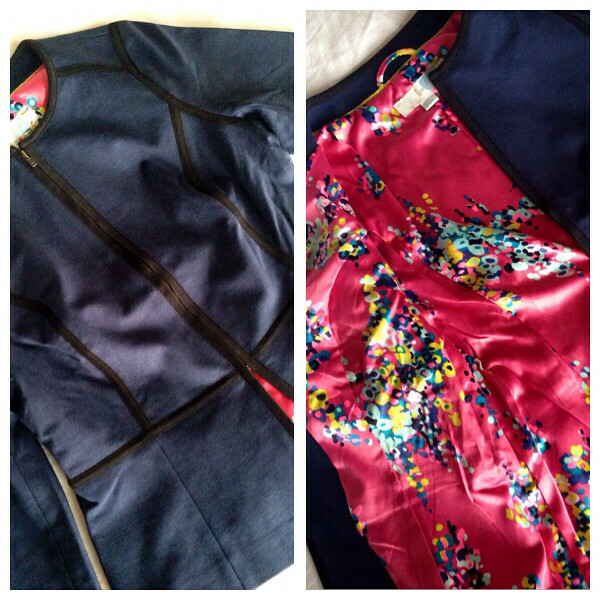 Both fab although ordered the long length and I'm not that tall....even long is short! Good reductions however now there's an even bigger problem....the autumn catalogue is out and it has some gorg winter work dresses.